Mr. Ovid Hall Harris, Jr., age 85 of Acworth, Ga., passed away March 29, 2010. Funeral services will be held Friday April 2,2010 11:00 am at the Piedmont Road Church of Christ in Marietta with Minister Forrest Chapman officiating. Burial will follow in the Westview Cemetery in Atlanta. Mr. Harris had lived in Fulton County most of his life before moving to Cobb County. 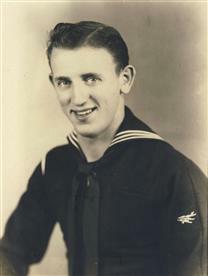 He was a retired mechanical engineer at Robert & Company Associates, he was a U.S. Navy veteran having served in the Pacific theatre during WWII aboard USS Skagit. He is preceded in death by his wife Agnes Endsley Harris. Surviving are; Son, Ray O. and wife Sara Harris, Kennesaw, GA., Daughter, Deborah and husband David Hardin, Dunwoody, Ga., Sisters, Hilda and husband James, Atlanta, Ga., Gayle Harris, 4 grandchildren, Keri Chandler, Kathy Otero, John Hardin and Ray Harris Jr., great granddaughter, Camille Chandler.